The topic of his speech was his book, THE BOOM: How Fracking Ignited the American Energy Revolution and Changed the World. Even more important was his take on the whole fracking industry and what it means for America. 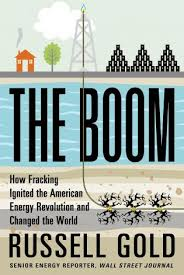 These are just a few examples of the types of topics Russel Gold, investigative journalist for the Wall Street Journal, tackles in his new book, The Boom: How Fracking Ignited the American Energy Revolution and Changed the World. The book is as engaging as it is fair balanced. For more information on the book, or to purchase a copy, please visit Brown Book Shop: The Boom, by Russell Gold. Gold started his journalism career at the Philadelphia Inquirer and the San Antonio Express-News. In 2000, he joined The Wall Street Journal and covered Texas and economics, before switching to energy in 2002. His reporting has taken him to five continents and above the Arctic Circle two times. In 2010, he was part of the Wall Street Journal team that covered the Deepwater Horizon explosion and oil spill. The Journal’s work was awarded the Gerald Loeb Award for best business story of the year and was a finalist for the Pulitzer Prize in National Reporting.He earned a B.A. in history from Columbia University in 1993. He lives in Austin with his wife and two children. The event was held at the historic Petroleum Club. The Petroleum Club is considered Houston's premier and most exclusive oil and gas industry club. First chartered back in 1946, the Petroleum Club was first located inside the Rice Hotel. The club moved to a larger location (now in the ExxonMobil Building) in 1963 as membership continued to grow. Gold joins the ranks of T. Boone Pickens and Rudy Giuliani, among other notables who have spoken at the historic Petroleum Club. To find out more about the Petroleum Club, please visit pcoh.com. The event was sponsored by the SPE, the Society of Petroleum Engineers. The SPE is the largest individual member organization for engineers and other professionals in the oil and gas business. The SPE is home to more than 124,000 members worldwide and boasts of a library with more than 50,000 technical papers. The organization's roots go all the way back to 1913 when the AIME formed a committee on oil and gas. The Gulf Coast section, its largest, was formed in 1935. For more information on the SPE, please visit SPE.org. For more information on the SPE's Gulf Coast Chapter, visit SPEGCS.org.